This is a basic report, just the 2-page chart report without any support from a nutritionist, dietary or supplement recommendations. No explanation is provided of the results, and as such it is designed to be used in conjunction with the advice of a suitably qualified nutritionist or doctor, who will be able to offer you further advice on how to use the information contained within the charts. Compare this with the full test. No explanation is provided of the results, and as such it is designed to be used in conjunction with the advice of a suitably qualified nutritionist or doctor, who will be able to offer you further advice on how to use the information contained within this the charts. Two pages of charts plus up to 11 pages of analysis of your individual metabolic profile, interpretation of results, including dietary recommendations, and a nutritional supplements course if required. Support from our qualified nutritionist (via email). Hair mineral and toxins analysis test kit, HTMA; check a hair sample to discover mineral imbalances and toxic metal overload. Toxic metals; "Heavy metals are individual metals and metal compounds that can impact human health" , there are many exposure routs; for example, mercury toxicity, mercury poisoning and contamination in the human body (dental labs historically used mercury for amalgam fillings). Heavy metals testing is utilised to screen (not as diagnosis) for heavy metal poisoning (acute or chronic). To monitor exposure to a number of heavy metals, it tests and measures the amount of (in particular) extremely toxic metals in the hair tissue (vs body fluid such as blood and urine, which are also used sometimes). A laboratory can offer a number of different types of heavy metals screens on top of tests for specific metals. The most frequently combined include mercury, arsenic and lead. This test checks for 37 elements in total, however the interactions and effects of all toxin permutations are unknown. A small variation in your dietary habits or the supplements you take daily can make a big difference to your health. The delicate balance of nutrients and minerals in your body can easily be disturbed. Adjusting the beneficial ratios of minerals present (like zinc or magnesium) can make a big difference. Compare with the FULL test, this basic test (just the charts) does NOT come with dietary recommendations, or a vitamin and mineral profile - NO supplements regime is included to help you detox heavy metals and boost the immune system. The sensitivity of the test detects elements recorded at milligrams percent ("milligrams per one-hundred grams of human hair") One mg% = ten parts per million (ppm). Take a look at the pdf sample hair mineral & toxins analysis report and see what elements are detected. 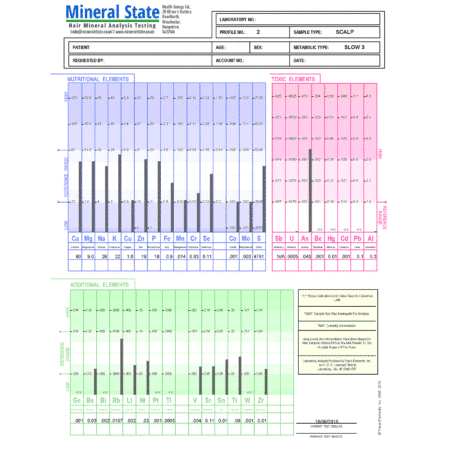 Download a sample of the test reportClick this link to view a sample PDF as a guide and overview to balancing your minerals. Existing in humans, we have all been exposed to the high levels of toxic metals over time, ever increasing amounts greater than the generations that came before us. We all have metals in our bodies; but how much is present varies, the challenge is to find out how much? Getting rid of them from the body can greatly enhance health, benefit cognitive functions and improve vitality, but how can we tell? 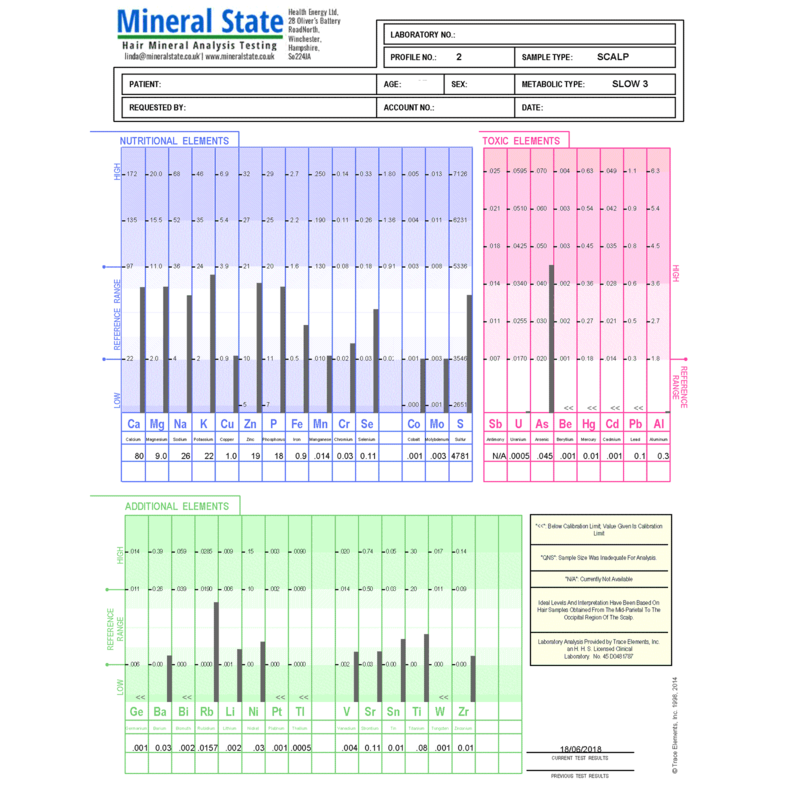 Hair mineral analysis is a toxicology screen that detects and measures metals including antimony, mercury, beryllium, uranium, cadmium, aluminium, arsenic, and lead. The test, instead of urine, stool or blood tests, can reveal heavy metals toxicities stored in the bones, brain and organs as they are mobilised and expressed in the hair. 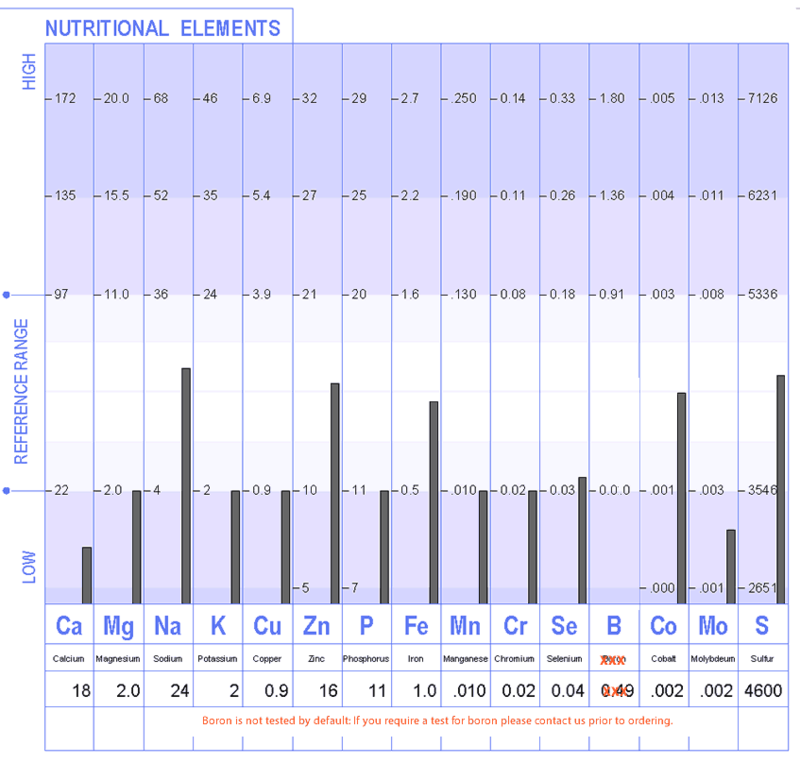 Column one shows the element's scientific name, the second columns tells you the elements periodic symbol. Elements listed above are toxic these "heavy metals" can interfere with the bodies normal biological processes and biochemical functions. Because they are present in the environment, they are present in all biological systems. They are poisonous to humans, ideally they should not be present in our bodies in any quantity as they are injurious to health, excretion of them if found is advised to avoid bioaccumulation, either by detoxing the body through a change of diet or vitamins and minerals supplementation. What beneficial minerals does hair analysis test for? 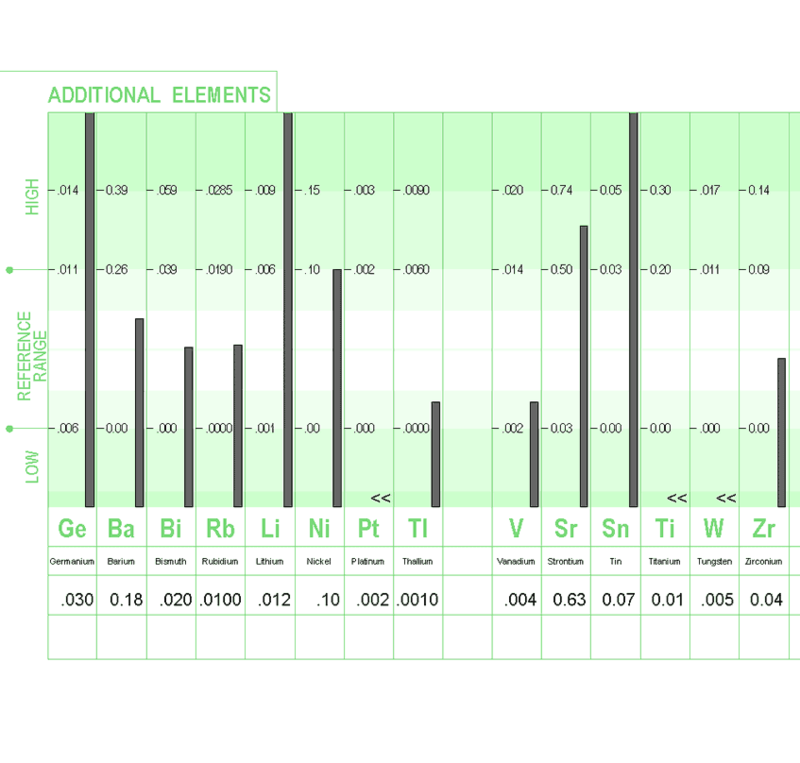 Column one shows the mineral element's scientific name, the second columns tells you the elements periodic symbol. Elements listed above are required by the human body to function correctly, they have been widely studied and are known to essential for many biological functions within humans. They play a part in many bodily processes including the endocrine system, muscular activity, maintaining the integrity of the skeleton and joints, reproduction and overall development. They must be replenished through the food we eat or vitamins and minerals supplementation. What additional elements does hair analysis test for? Additional elements listed above are thought to be of benefit to humans, research is ongoing as to the correct amounts required and their potential benefits, they are obtained either through our diet or vitamins and minerals supplementation. How is the hair sample collected for testing? Heavy metal testing using hair is performed in order to detect toxic metals and mineral ratios in a hair sample. 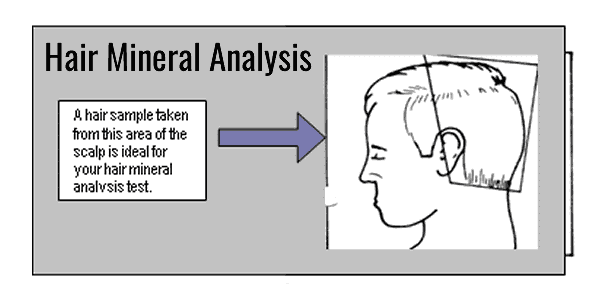 Hair mineral toxins analysis is a good method to check your body for toxic element levels. Being tested for heavy metals, with tests using hair to measure the quantity of toxic metals in your body, can give you a reading over a longer period of time (In comparison to blood or urine testing). Watch this short video to see exactly how to take a sample of hair for the test using the home test kit. How to use the test? Watch the video by Mineralstate (suppliers); here are the complete instructions of how to test hair for heavy metals and minerals in your system; (a systematic list to guide you is below the video). The test kits for elements and toxic metals all include detailed instructions. Please fill out your details in the request form supplied with the kit and return your sample of hair in the pre-paid envelope. A clinically proven laboratory test, where you can check a hair sample in a state-of-the-art lab. Toxic metals can bio-accumulate in the body's tissues over time. What the test can show you for example is; if arsenic, lead, mercury or aluminium is present in the hair sample, (the home kit includes easy to follow instructions). Discovering your body's toxic overload - Its worth it, as a way to find hidden harmful elements before they get the opportunity to cause health problems. Do not let your overall health and well-being deteriorates due to toxic metal accumulation, without testing, they cannot be verified. The definition of a heavy metal is a natural element that has a density and atomic weight of five times or more than that of water. Because they are used widely in industry, agriculture, technology it has led to their prevalence in the environment leading to fears about their influence on human biochemistry and their environmental impact. The route of exposure, the age of the subject and their genetics and nutritional status can all play a part in the toxicity of heavy metals. The principal metals that lead to health problems for humans include arsenic, cadmium, chromium, lead and mercury due to their high degree of toxicity. Even at low levels of exposure these five metallic elements are toxic and can lead to severe organ damage, they are also cacogenic. Their toxicity, genotoxicity and the fact that they are cacogenic makes it an important area of study and analysis by the medical establishment and scientists as they try to ascertain environmental levels and health related issues associated with exposure. Heavy metals toxicity in humans has grown as the usage of chemicals in industry and the levels of pollution from our environment increases. Toxic metals are deposited in in our body’s tissues and organs, high levels of dangerous toxic metals can lead to a range of serious health conditions for adults and children including developmental and neurological damage. If you want to ascertain your levels of exposure to toxic metals then a metals hair test is a useful device. The use of hair as a biomarker can provide health practitioners with a tool to ascertain the levels of essential elements and harmful toxic elements in our bodies. Over many years, the science behind the measurement of hair element levels has been refined and improved to determine the level of elements in human hair samples. Because hair is not regulated by the homeostatic mechanisms, it has distinct advantages over blood and urine. Primarily it is possible to detect variations in hair element levels before any symptoms can be detected of physiological problems occur overtly. Used in conjunction with other diagnostic procedures hair metals analysis is a useful tool for physicians to help in diagnosis of problems and disorders in the human body related to toxic elements and their metabolism. The use of the hair (not the follicle) is ideal because once the elements are recorded in a tissue sample it acts as a permanent record. As the hair grows, it incorporates a record of the elemental status of the subject and their exposure to toxic elements that is why it is an ideal medium for sampling. The levels of nutrient elements in hair are proportionate with the levels in organs and other tissues; It is not practical to take samples of bones or other organs for elemental levels, which is why hair is the ideal tissue sample. Our bodies require nutrient elements to function; they play an important role in the absorption of certain vitamins and are responsible for many functions within cells in the body. The body does not store toxic elements in the blood or urine; in fact, the hair can retain a much higher concentration of elements. Therefore, hair is an ideal tissue for the detection of exposure to harmful elements, of particular concern is the presence of mercury levels as this is can be transferred to infants from mothers through their neurotoxic methylmercury exposure from the consumption of fish such as tuna. As the procedure of hair sample testing for toxic elements has improved over the last 40 years, so has its reliability and usefulness as an effective tool for analysis of essential elements for doctors and patients alike. Provided the testing is conducted by a reputable laboratory and the sampling, procedure is carried out correctly and the sample is handled by professional trained staff then it is considered a precise analytical method for the determination of nutritional and toxic elements. The analysis of heavy metals in a hair strand should not be considered as a diagnostic test but rather a screening test for the detection of irregular levels of elements. The data obtained should be viewed by a trained professional and assessed with the help of other laboratory tests. “Heavy metals toxicity” testing is a clinical screening hair test for the accurate evaluation of high levels of toxic metals, minerals and trace elements concentrations. 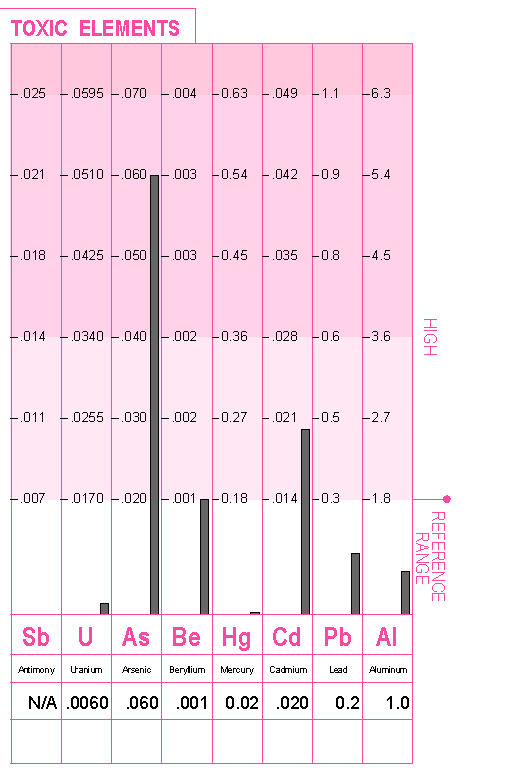 Shows a person’s clear exposure ranges of toxic metals using a hair sample profile. 1 Test Kit. NB: The lab report is 13 pages long please check the sample report. The kits come with (with diet and nutrient recommendations) personal support from a nutritionist via email to help you understand the test results.